As I mentioned in Part 3: Product Pages and Cart Summary, Best Buy, Sephora, Target and Moosejaw’s new site don’t support mobile checkout. Sites mentioned in this post are Barnes and Noble, Amazon, Sears2Go, Moosejaw’s old site and Ralph Lauren. 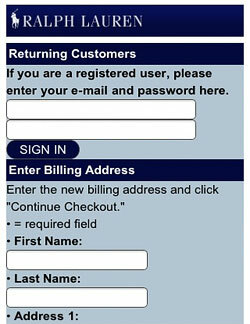 Nobody wants to be forced to register before checkout on the Web, how much more on a mobile device! 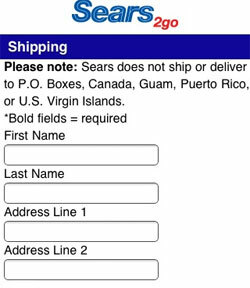 Sears2Go also explains the benefit of registration and allows guest checkout, but puts the guest checkout option first and includes a bold button with the label Guest Checkout. Sears understands customers don’t necessarily read text, and Guest Checkout is self-explanatory. 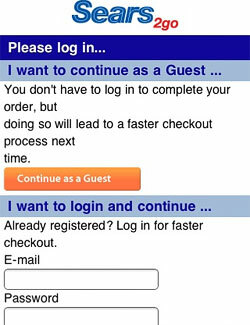 Showing guest checkout first can improve conversion, as the customer is less likely to assume he/she needs an account or will be forced to create one to proceed. 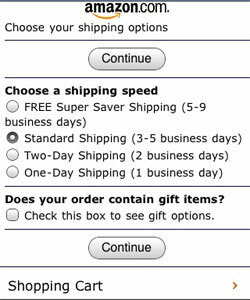 This approach assumes the customer wants the fastest checkout possible, which customers appreciate. 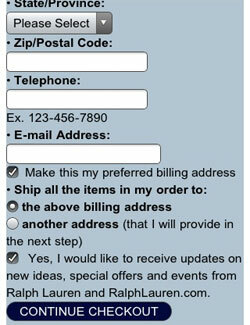 Ralph Lauren combines the sign in page with the first step of checkout (billing and shipping information). This approach can reduce the total number of steps. Amazon’s simple log in is consistent with its Web checkout. It’s actually a required registration — but it appears so easy it doesn’t feel like a forced reg, your account creates itself as you go through the checkout process. 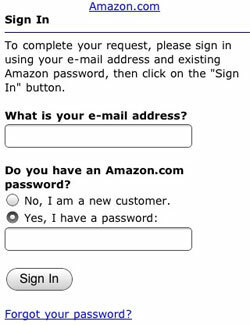 The downside to customer log in is it relies on email and password combinations which returning shoppers often forget (you have to remember at least your email address to request a password hint). Many simply create a new account – making it harder to reconcile customer information (one loyal customers looks like 5 flaky ones). This is an issue for both online and mobile channels. The earlier in the checkout process you ask for an email address, the easier it is to follow up with a customer if the cart is abandoned with a triggered recovery email. Though the idea of chasing after a customer for changing his or her mind is controversial, many retailers have managed to save sales this way. The longer the form, the more tedious it appears and the less the customer wants to bother with it. 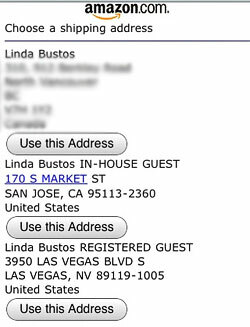 But most customers recognize asterisks (*) separate the required fields from the optional, so it’s key to include them. It’s not a good idea to provide unconventional instructions like *Bold fields are required (which fields are bold below?). Never assume your customer is going to notice. The only thing that’s confusing on a mobile screen is which button corresponds to which address when you have more than 1 or 2 to choose from. A little triangle marker pointing to the address on each button would help. 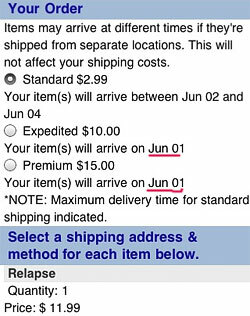 An incorrect shipping address is a major problem. 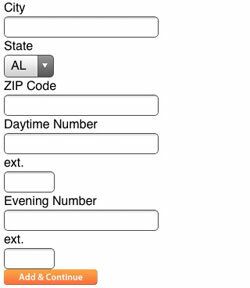 A side note: Moosejaw’s old site (the new site has no checkout) had a time-saving feature where you enter your phone number in the first step, and based on your area code your city, state and country are pre-filled in the Billing Address step. Many retailers like Amazon remove navigation when a customer enters the checkout process in hopes to keep the customer in the funnel, but this can be a problem if the customer wants to make a last minute edit or add more products to the cart. 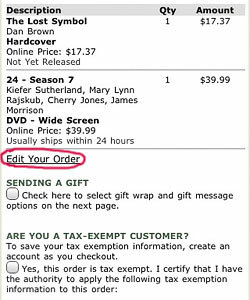 Barnes and Noble allows cart editing, and Sears2Go allows an escape back Home or to the Shopping Cart summary. 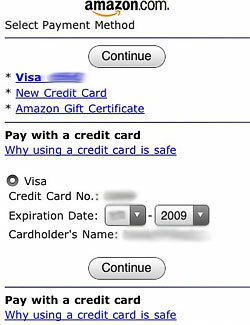 Even Amazon has a “Shopping Cart” link in it’s mobile checkout. 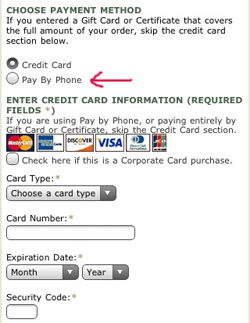 I didn’t notice any alternative payment options like PayPal mobile, but Barnes and Noble interestingly provided a Pay By Phone option. This isn’t a bill-to-phone-bill option (as discussed in the Multichannel 2.0 webinar), rather you can “Call 1-800-843-2665 (1-800-THE-BOOK)” to complete your order. You will be given a confirmation number to cite when you call after you have completed your order (on your phone and by email). 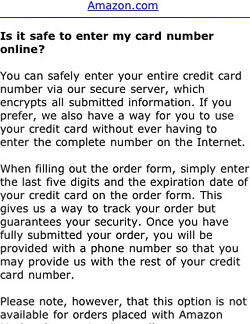 Perhaps some customers perceive this as more secure than entering a credit card over an unsecured mobile network, although placing an order by telephone carries its own security risks. 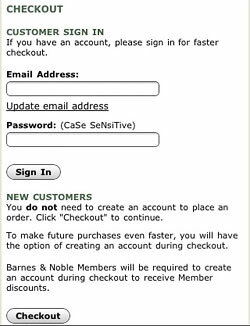 It might also be a headache for Barnes and Noble if customers complete orders and don’t follow through with the phone call authorization. With only a handful of reference sites, this series is not intended to be a best practices guide, rather a collection of recommendations based on observations. Please keep in mind I was viewing these sites with the iPhone and experiences on other devices may vary. Most usability guidelines for the WWW carry over to Mobile Web, while common usability problems are exacerbated by mobile devices’ smaller screens and keyboards (or lack thereof), flakiness of mobile Internet connections and lack of standards between mobile designs, browsers and operating systems. My recommendation is to have a mobile friendly site if the mobile channel is part of your retail strategy (whether for transactions or just customer service). When designing for the mobile Web, make sure you check out competitors’ sites in your industry, test your site on many different devices and involve real users in your testing. 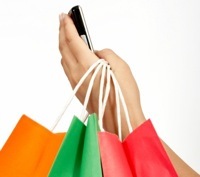 I would love to hear your thoughts on your experience on mobile commerce sites, on this blog series or about your own efforts with mobile commerce in the comments. Next articleIs Free Shipping More Attractive Than A Dollar Discount?